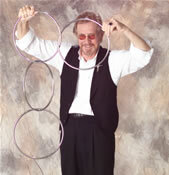 Johnny has lived a lifetime of entertainment as a magician and standup comedian, making people laugh! Johnny has over 35 years of professional entertainment experience performing at Hollywood celebrity parties, corporate functions and major events, as well as acting and technical directing in film and television. He has combined the principles of magic, engineering and design skills to become a team leader in the corporate world because he is as comfortable performing a magic routine as making a presentation to a corporate team. Moon is a master of audience participation, handling groups of people on stage with no embarrassments, just a hilarious bunch of fun. Johnny is a true sleight-of-hand artist, walking around interacting with guests, but is equally facile at performing on stage with illusions. He also trains and develops acts for other artists, as well as designing and selling illusions to working performers. He develops magic with a message, product tie-ins, educational shows and power-of-the-mind presentations. Not content to struggle as an actor/performer he continued his studies in engineering and began working as a design engineer. Johnny believes that his background in magic allowed him to design and engineer much faster due to the fact that learning magic has the same challenges and principles that are not unlike those one faces in engineering. He then started his own engineering company so he could budget his time between magic shows and running a business. 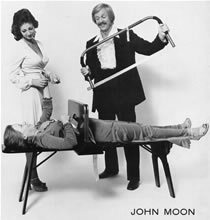 Johnny also became well known in the Los Angeles area for his unique magic shows. And then he then made the magic show a full time enterprise. 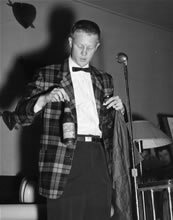 Along with his many private engagements, he had the longest running weekly magic show--"The Magic and Music Show"--at the world-famous Ice House in Pasadena, California, where he also produced and starred in the original "Teen Hootenanny" which was judged by show business notables and movie stars and showcased young, now famous performers. Moon also worked as an actor and technical director in Hollywood motion pictures. 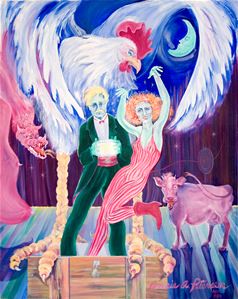 Later on, Johnny and Annie, his magic partner and wife, co-produced and starred in a full stage, comedy magic production called "The Chicken Magician and His Side Chick." 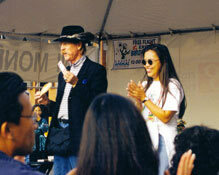 Their show played all the big venues in the Los Angeles area, including colleges, the L.A. County Fair and Television. 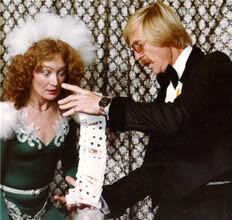 The L.A. Times voted them "MOST IN MAGICIANS." 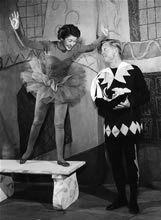 The couple then expanded their business into Arizona and New Mexico, where Johnny began performing for corporate events in the big resorts and developed a following with family shows from birthday parties to school functions, summer camps, libraries and teaching magic. Currently, Johnny resides with his wife, Annie, in the Santa Fe/Albuquerque, New Mexico area, and they travel throughout the western United States with their magical productions. When not performing at corporate events, Johnny can be seen at local schools, festivals and family parties.